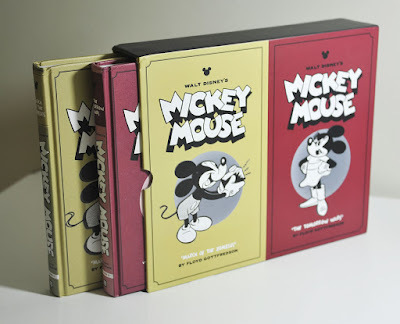 I like to get the box sets of the Floyd Gottfredson Library from Fantagraphics, and usually I get them in the mail right before Christmas. This year however I didn’t get them until after I got home from the holiday vacation, so I still haven’t found the time to read all of it. But from what I’ve read so far I have just one thing to say; you need to get these books now! The 4th box set collects all the daily Mickey strips from May 1942 to July 1946, and as usual the books are packed with articles and bonus material. The highlight from what I’ve read so far are the rare gag-a-day strips made for British newspapers. I had no idea they even existed! 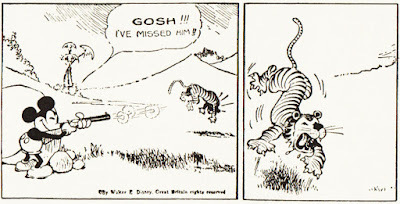 As the British newspapers ran the daily strips seven days a week instead of 6 days a week, 11 filler strips were made. They re-used art from previous adventure strips to make new gag stories, and it’s a lot of fun trying to compare the art. Here is one example. 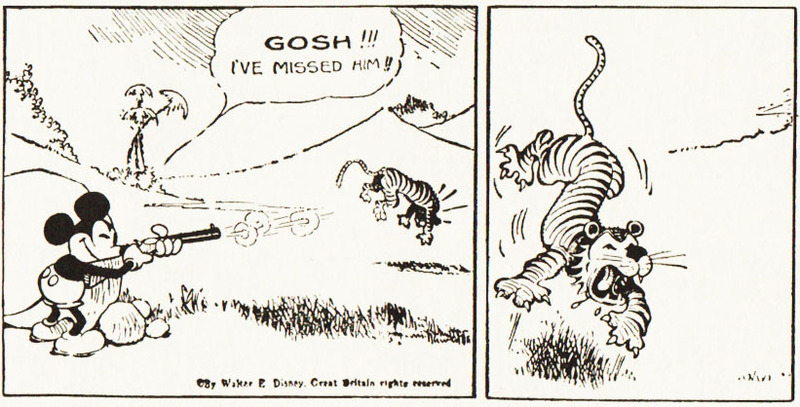 The following two panels are from the British filler strip, published July 13, 1930. Among all the goodies in this box set is an "Appreciation by Casty" article. The article is illustrated with two great covers made for the Norwegian "Mikke Mus & Langbein" ("Mickey Mouse & Goofy") Christmas comics. But the cover for "The Black Crow Mystery" printed in the book is actually not the version used in Norway! As you can see on the picture of the two comics in question, in the published cover the crow holds a club, while in the illustration used in the book he has a bomb instead. I might come back to this box set in a future blogpost. But I’ll end this one with a side note. 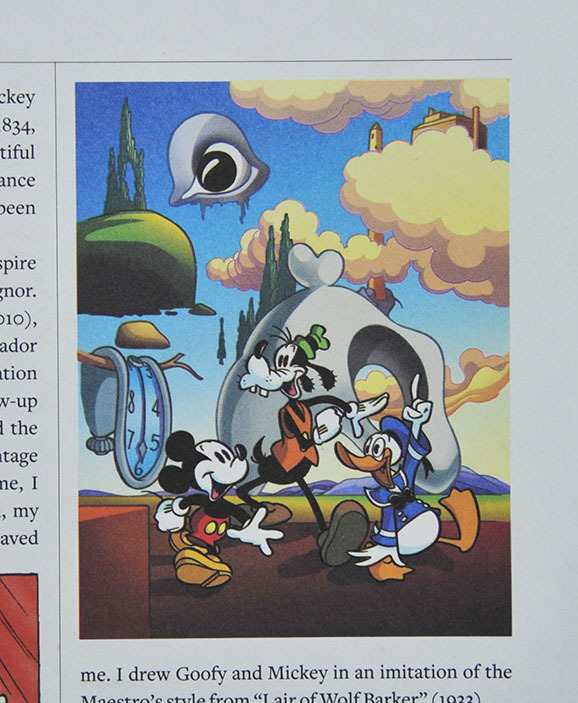 There’s also an "Appreciation by Cavazzano" article in volume 8, illustrated with a cover drawing from Topolino. But did you know that this cover was almost used for an American comic too? The planned but canceled Walt Disney’s Comics #720 from Boom! was supposed to have the cover and the story "Topolino e il surreale viaggio nel destino" (featuring Walt Disney and Salvador Dali). According to the article the English title is "The Persistence of Mickey", but as far as I know no English translation has been published yet. If any archival editors (hint hint) read this, I hope we get to see it some day! The Norwegian Crow cover variant with the bomb came first. Unfortunately, there was a real life bomb tragedy in Norway just as the magazine was going to press. To avoid inflaming tensions, I had Casty partially redraw the image to show the Crow's other weapon instead. But now, years later, it wasn't a problem to show the bomb version of the cover. 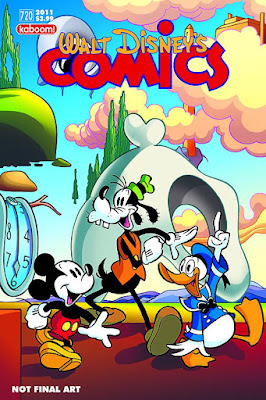 Word on the street says that the Archival Editor who put "The Persistence of Mickey" cover into FGL 8 is also the Archival Editor on other Disney comics. I'd like to get the story onto the IDW slate, but I can't make any promises yet. Ah, so that’s the reason for the two cover variants. I don’t think I would have made any connection to the bombing seeing the original cover published at the time. But it’s always best to be on the safe side. I think both cover variants works fine for the story.